At the recent 88th Geneva International Motor Show, Richard Mille and McLaren Automotive turned their partnership into something tangible with the RM 11-03 McLaren Automatic Flyback Chronograph, a limited edition that will be available only to a rarefied group of petrols heads, at least for now. The watch will only be sold to owners of McLaren’s Ultimate Series, the carmaker’s uber-performance cars that now number just three models, the F1 and P1 – both long sold out – and the Senna P15 that just launched alongside the wristwatch but also already sold out. 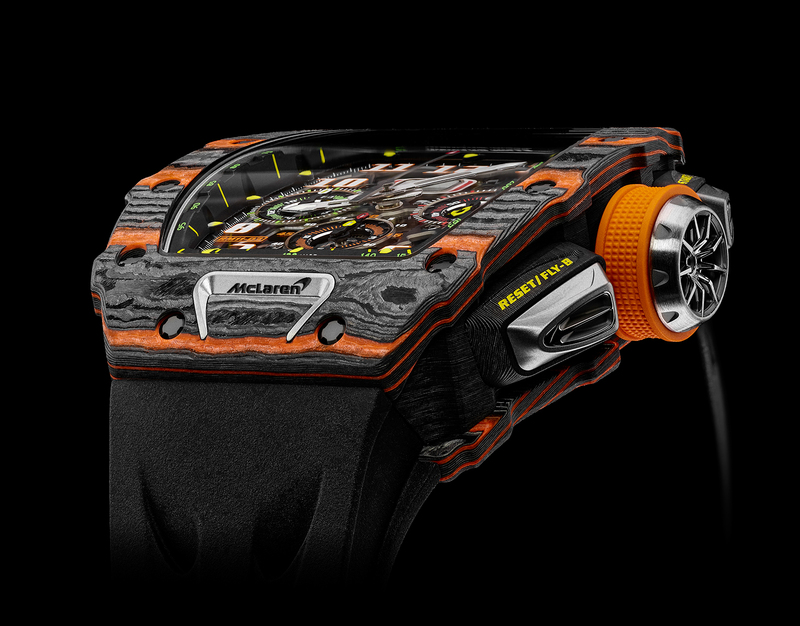 Richard Mille having become the official watchmaker for McLaren in early 2016, with the first collaboration between the two being the million-dollar RM 50-03 McLaren F1 unveiled last year, which was a tie-up with McLaren Formula 1. 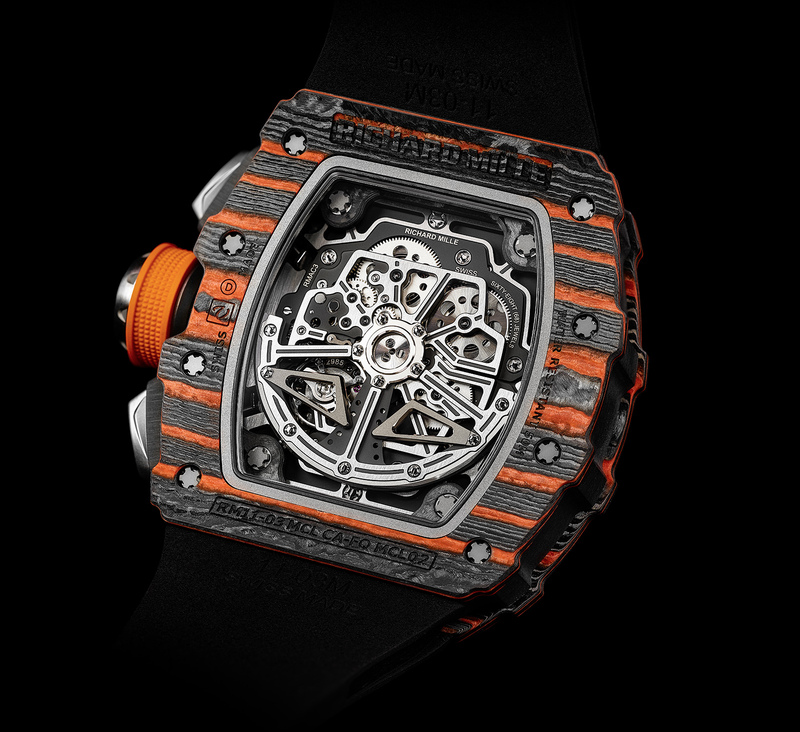 The new RM 11-03, however, was conceived by the watchmaker and McLaren’s car making arm. Notably, the watches come on the back of McLaren’s split with TAG Heuer after a 30-year run. And in ironic twist, TAG Heuer also recently announced a partnership with Aston Martin, after Richard Mille’s association with the maker of James Bond’s ride came to an end in 2016. 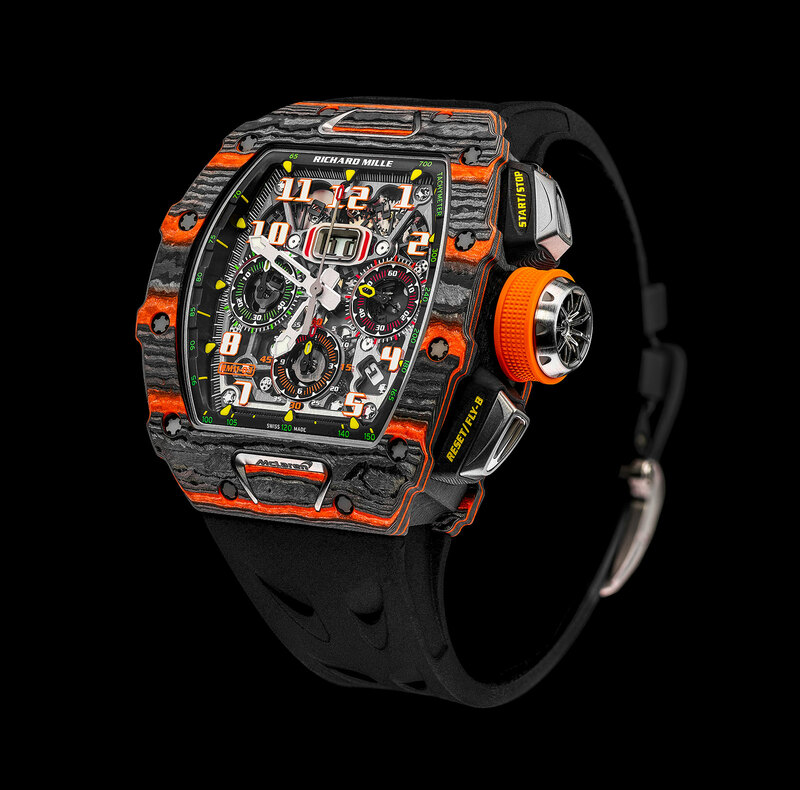 The two-year wait has resulted in a tremendously striking wristwatch that just shouts Richard Mille. Jointly designed by McLaren Design Director Rob Melville and Richard Mille engineer Fabrice Namura, the RM 11-03 McLaren is based on the stock second generation RM 11 but tweaked to include immediate references to the carmaker. 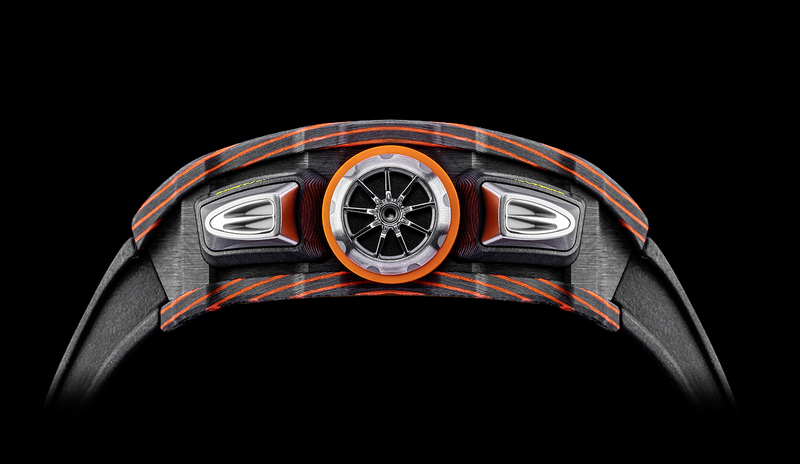 Measuring 44.50mm wide, 49.94mm in length and 16.23mm thick, the watch is lightweight due to the materials used for the case, a combination of two carbon composites exclusive to Richard Mille in timepieces: Carbon TPT and Orange Quartz TPT. Short for “Thin Ply Technology”, the material are ultra-light carbon composites made from layers of carbon and silica fibres layered at different angles to each other, creating the distinctive striped pattern when the block of material is cut. The titanium chronograph pushers are reminiscent of the McLaren 720S headlight, while a pair of titanium inserts modelled on the McLaren F1’s air intake snorkel are inlaid on the bezel at six and 12 o’clock. And the titanium crown is shaped like a McLaren wheel rim and covered in orange rubber. The movement is nearly identical to the RMAC3 found in the standard RM 11, with the same key specs: double barrels for a 55-hour power reserve, an annual calendar with outsized date as well as a flyback function. The base calibre is built by movement maker Vaucher, while the chronograph module (that also has an annual calendar) is courtesy of Dubois-Depraz, a complications specialist. What sets this movement apart is the fact that the base plate and bridges are in black-coated titanium for greater rigidity. 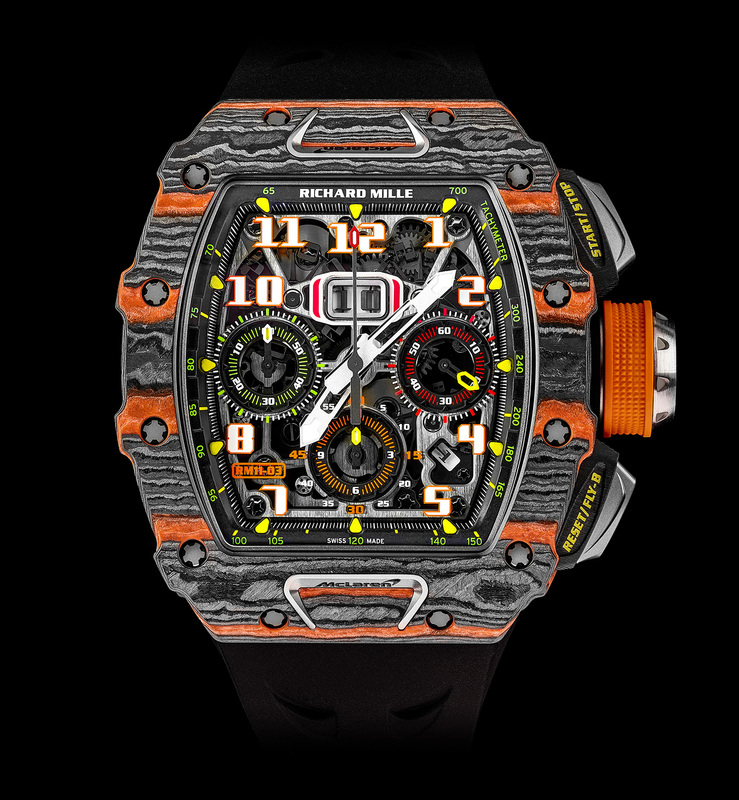 Limited to 500 pieces, the Richard Mille RM 11-03 McLaren Automatic Flyback Chronograph is priced at SFr180,000. It is available only to McLaren Ultimate Series owners, and buyers of the Senna P15 will be able to choose a watch serial number that matches the number of their car (which is also limited to 500 pieces). Stephen Forsey was taking me through the cacophony of information around the Grande Sonnerie. Not just a grand sonnerie, but with a 24-second inclined (at 25 degrees) tourbillon on the side – literally. The watch has the ability to not only operate as a grandfather clock, chiming the hours and quarter hours (or just the hours in petite sonnerie mode if you wish), but also to chime the time on demand as a minute repeater. And if you have had enough of listening to the perfectly audible tones, you can simply admire the fastest tourbillon cage haute horlogerie has to offer as it gyrates at a rapid pace, taking 24 seconds to complete a revolution. All that in a wrist watch – it is a formidable achievement, and took a team of watchmakers and engineers over eleven years to perfect. The upshot of all this is a chiming watch that is arguably the market leader in its rarefied category, albeit for a considerable price tag. Grand sonnerie wristwatches are very rare in themselves. As complications go they are perhaps the most difficult to master. The degree of difficulty lies in the chiming mechanism, which is linked to the timekeeping train, and can strike as often as every 15 minutes. Hence, there are few manufacturers that have been able bring such a wristwatch to completion. In fact, barely a dozen have, including Phillipe Dufour, who was the first to do so in a wristwatch, Gerald Genta, Vacheron Constantin (with a bit of help from Greubel Forsey), Jaeger-LeCoultre, Patek Philippe, Audemars Piguet, and F.P. Journe. The wish to work on a chiming watch had been a long-standing one for Greubel Forsey. Both Robert Greubel and Stephen had worked on vintage grande sonnerie clocks earlier in their careers, so the wish to interpret the chiming watch in their own way was always on the cards. The watchmakers went to extraordinary lengths to reinvent the complication – the watch took 11 years to develop – making the Greubel Forsey Grande Sonnerie one of the best in this tiny segment of clockwatches. The reasons for that are fairly complicated, so here goes. With the same case and dial aesthetics as the other tour de force Greubel Forsey complication, the Quantième Perpétuel à Équation, the dial style is easy to understand and has become part of the design language for its complex watches. Despite the complexity of the movement beneath, the Grande Sonnerie dial is parsimonious and easy to read. The dial is relatively straightforward, arranged according to the various functions of the watch. The time is shown on the central hands. There are two power reserve indicators: the main one at two o’clock is for the sonnerie; the smaller one at five o’clock is for the mainspring that powers the time display. A small sub-dial at three indicates the sonnerie setting, adjusted via the selector button at four o’clock on the case. While the aperture between ten and 11 o’clock shows the hammers and gongs of the chiming mechanism. The double-ended seconds hand is linked to the tourbillon, one that as with Greubel Forsey’s other 24-second inclined tourbillons, rotates at a mesmerizing speed inside its own sapphire capsule on the lower left of the watch. The literal translation of sonnerie is literally “striking”, as in bell. And the Grande Sonnerie has three settings: grande sonnerie (grand strike or “GS”), petite sonnerie (small strike or “PS”), and silent. In grande sonnerie mode, the watch will strike on the hour and quarter hours en passant, or in passing, just like a large clock tower or grandfather clock. That means chimes at the top of each hour (between one and twelve single chimes) and every 15 minutes (one to three double chimes). At 9:45 the watch will chime nine single tones and three double tones. As you might expect, petite sonnerie means chimes only on the hour. And silent mode speaks for itself. 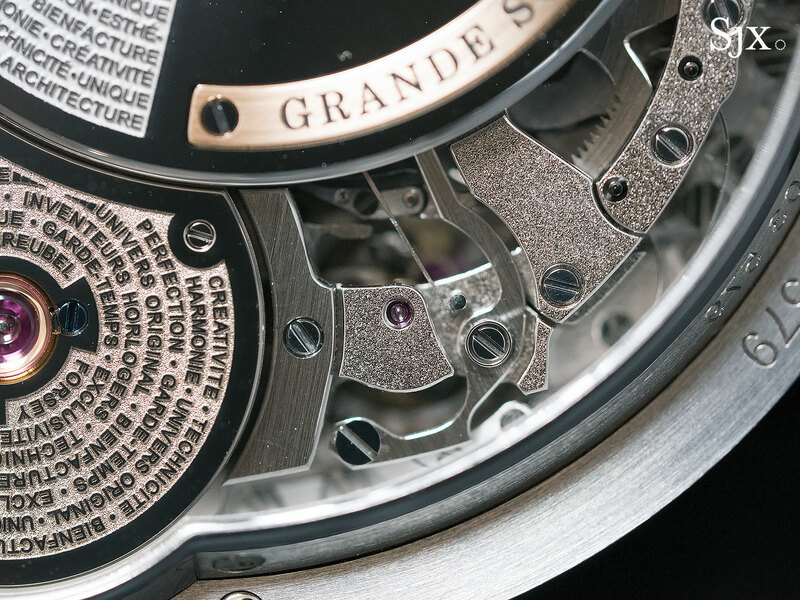 What makes the grande sonnerie so complicated is that the striking mechanism requires a separate power source. Consequently the movement has two barrels and trains: one for timekeeping, and the other for the sonnerie. Timekeeping portion has a 72-hour power reserve and needs to be manually wound, while the barrel for the sonnerie has an automatic winding mechanism with a platinum rotor. Fully wound the sonnerie barrel will run for 20 hours on full strike mode. 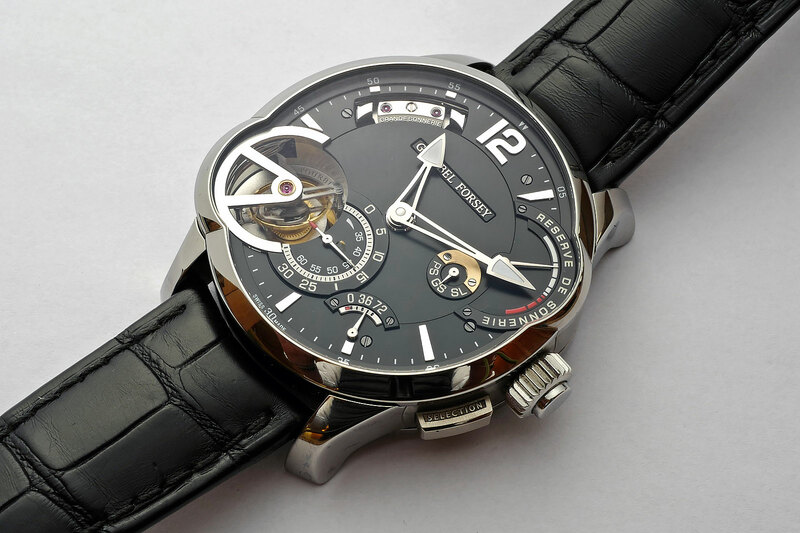 The platinum rotor is an example of black polishing at its most extreme, even by Greubel Forsey’s high standards. Its surface is flawless and reflects back almost as exactly as the surface of the mirror in interstellar telescope. To complicate matters further, the watch also has a minute repeating function, which chimes the hours and minutes on command. 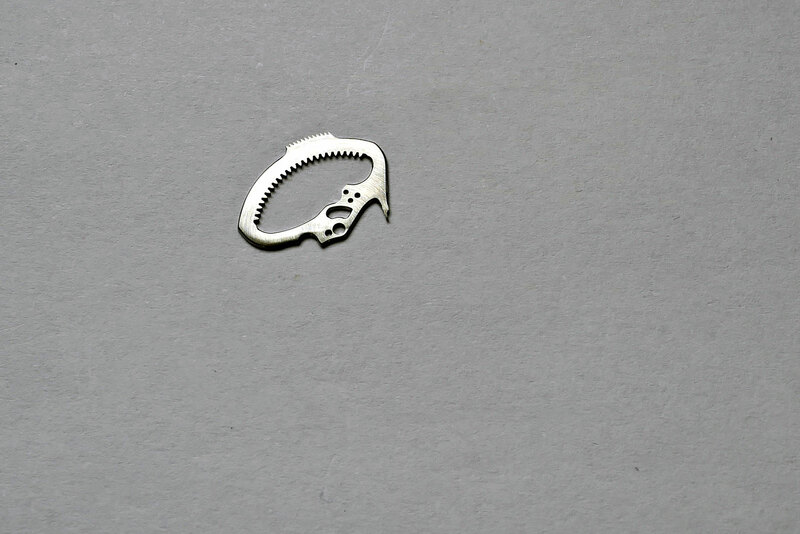 Most traditional minute repeaters use a slide, usually mounted on the left side of the case, to wind a tiny, secondary spring that powers the repeater chiming. The minute repeater mechanism within the Grande Sonnerie has its own dedicated mechanism to chime the time, one that is activated simply via the button integrated into the winding crown. 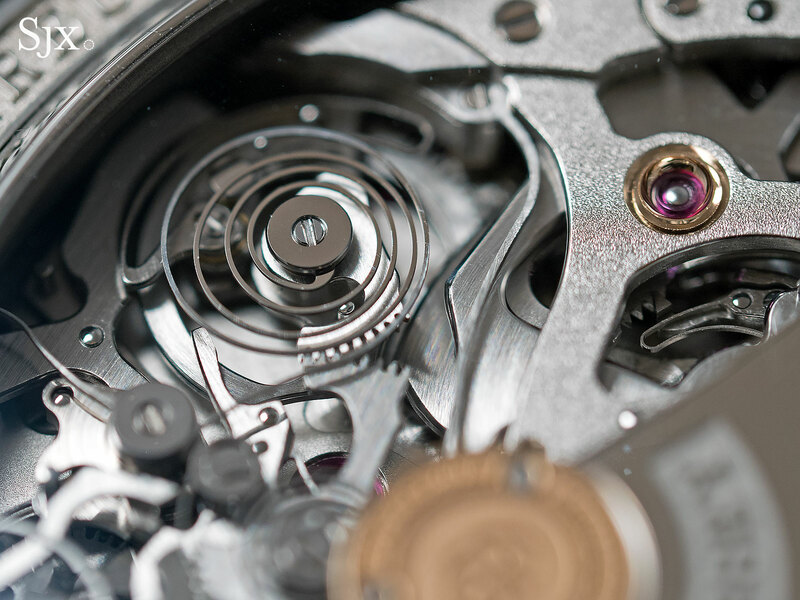 The repeater mechanism is linked to the sonnerie gear train, which powers the repeater mechanism, allowing the minute repeater to function even when the sonnerie is on silent mode. A watch of this complexity had a number of areas that needed to be reexamined in order to develop a progressive movement. First and foremost were the gongs. A striking watch without the right sound, for all the other technical accomplishments, would arguably fail at the first hurdle. Greubel Forsey concentrated on the two elements that make a chiming watch an audible pleasure, the sound and the pace of the chimes. Or in tangible terms, the gongs, and the silent governor. 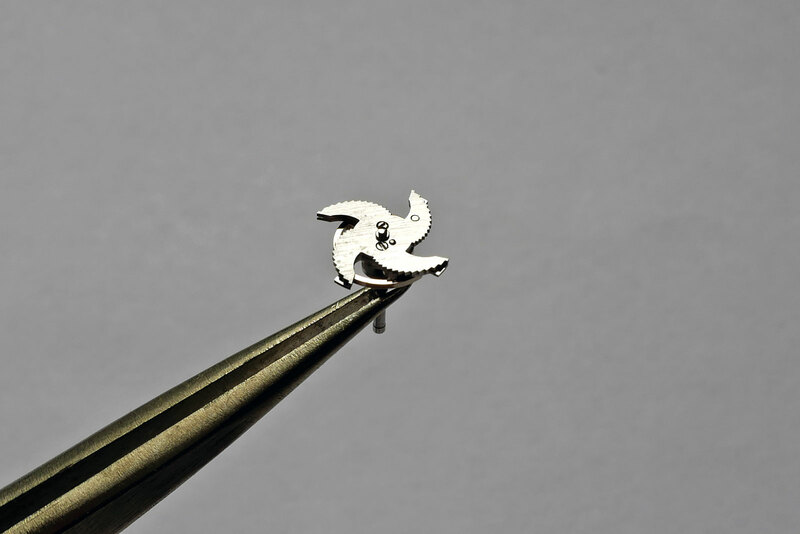 A whole team of watchmakers was responsible for the gongs. Made of steel, the gongs are first tempered to increase their hardness, and then tested for tone and resonance. And because they are cathedral gongs, each circles the movement almost twice over, with the increased length providing a more sonorous tone. For each set of gongs, an individual hand-wound music box, complete with a key (pictured at the very top), was constructed and the gongs installed, so as to experiment with different tones for the gongs. In addition, the gongs were not merely round, instead they had to be designed to accommodate the asymmetric tourbillon aperture. A second team was responsible for the gear train and regulator, which determine the speed at which the chimes are struck. 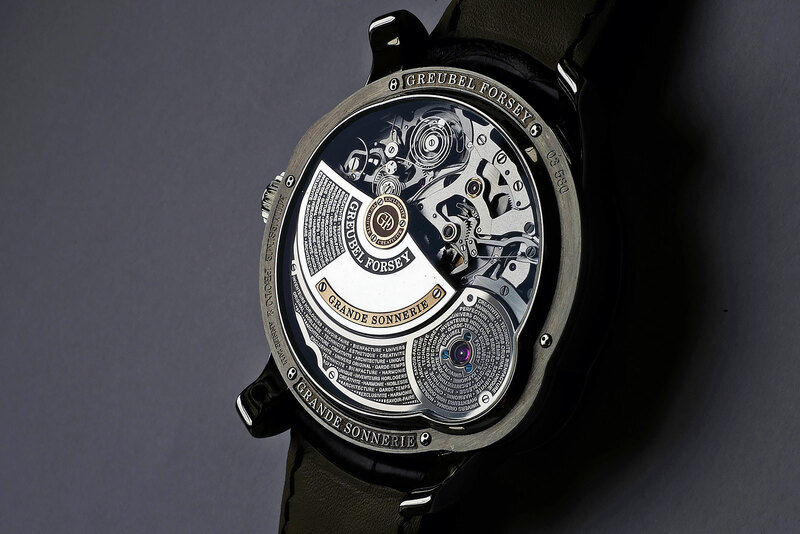 In the Grande Sonnerie, both the timekeeping and minute repeating mechanisms are powered by the hand-wound mainspring. 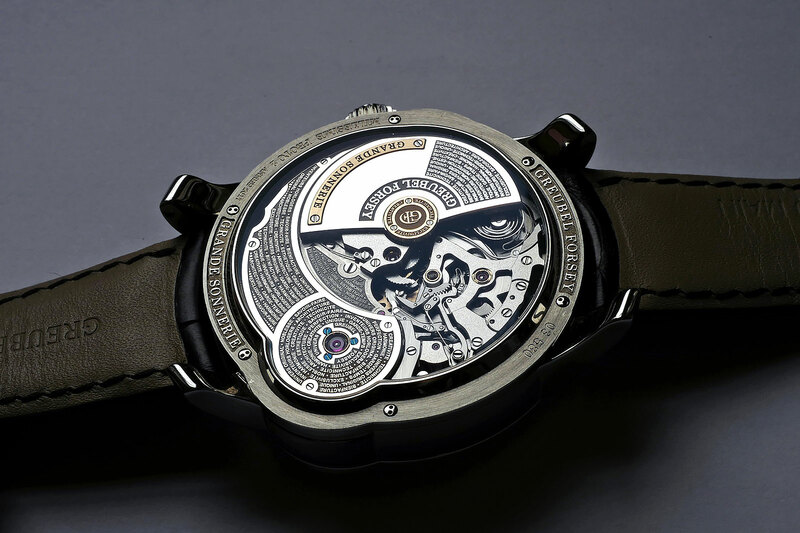 Stephen reasoned that it allowed the owner of the Grande Sonnerie to interact with the watch. However, it does require that the owner is mindful of the power reserve and remembers to wind it. Often in an ordinary repeating watch, the pace of the strike is determined by the power reserve in the mainspring. The regulator ensures that the Grand Sonnerie has a regular, measured and melodious strike pattern, independent of the power reserve. Part of the sound quality is also down to the flawless and highly polished case in titanium, a metal that has become a favourite for makes of chiming watches due to its low density. The other positive from the highly polished and immaculately finished titanium case is that the watch is very wearable. Although the dimensions are on the generous size, 43.5mm in diameter and 16.13mm high, the case material makes the case less of a weight on the wrist than comparable watches, or any watch with 935 components in the movement for that matter. What is also impressive is that Greubel Forsey managed to fit three major complications in what might regarded as its standard case size. Because of the complexity of the movement, and fragility of the parts, Greubel Forsey devised 11 safety mechanisms. 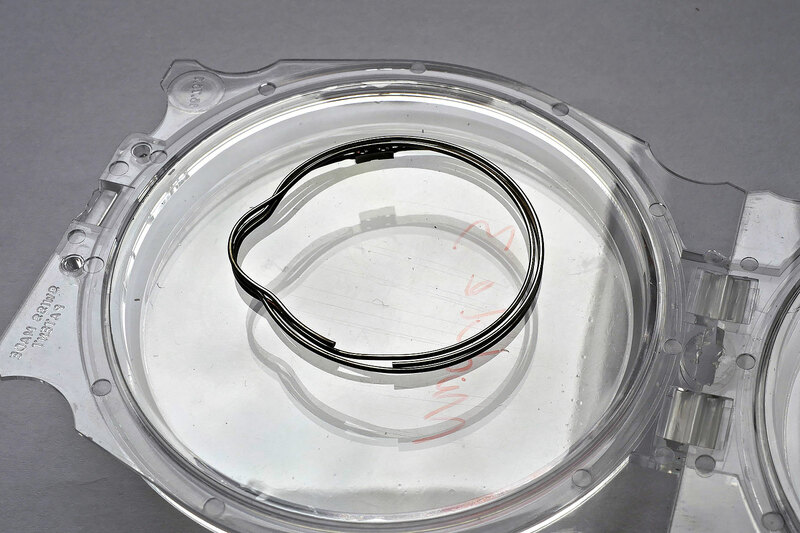 Such safety features are often undervalued, but very necessary in complicated watchmaking. Inept or careless adjustment can cause considerable damage to the mechanism, leading to time consuming and pricey repair. One of the safety measures is a mechanism that disengages time setting when chiming is in progress, and vice versa. The safety mechanisms are all new and innovative, and have patent pending. Greubel Forsey’s Grande Sonnerie is also impressive for being water resistant to a depth of 30m. Most sonnerie or repeater wristwatches are not water resistant because of the pushers or slides required to operate the striking mechanism, and also because waterproofing the case diminishes the acoustics of the chimes. 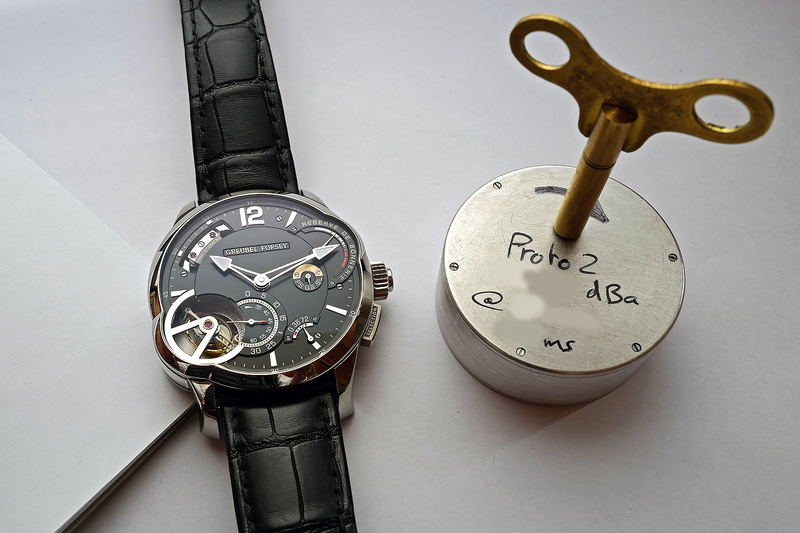 But given the market for very high-end watches such is often in places with humid climates, Robert and Stephen focused on making the Grande Sonnerie wearable anywhere. To do that Greubel Forsey created an inner, titanium resonance cage to amplify the sound of the chimes, making the watch impressively audible. What the safety features and water resistance do is make the watch wearable on an everyday basis for the owner, while rendering the watch secure against the environment – both the owner and surroundings. I can think of few other watches on the market with the same degree of functions or complexity. 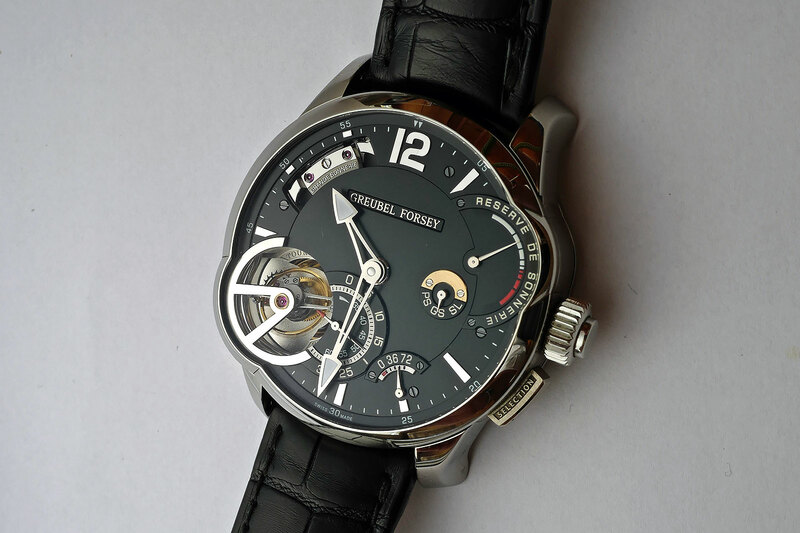 Add in the typical obsessive finishing of Greubel Forsey and the Grande Sonnerie is arguably the best in class. The Grande Sonnerie is not a limited edition, although production will be limited as it takes almost 18 months to finish an example, and there are few watchmakers with the necessary skill to do it.